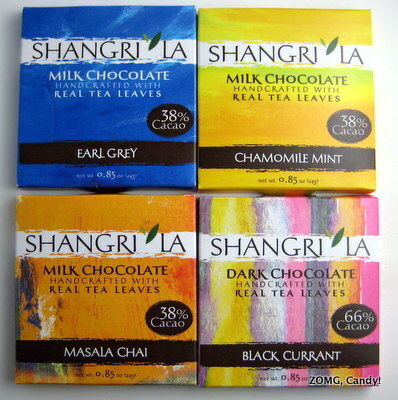 Shangri La is a tea company that’s now making inroads into tea-flavored chocolate. They sent me free samples of their line-up to review. 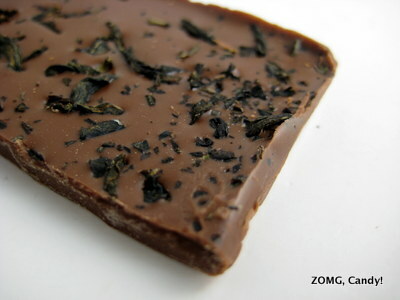 I’ll cover the Earl Grey and Masala Chai today, and the Black Currant and Chamomile Mint on Thursday. 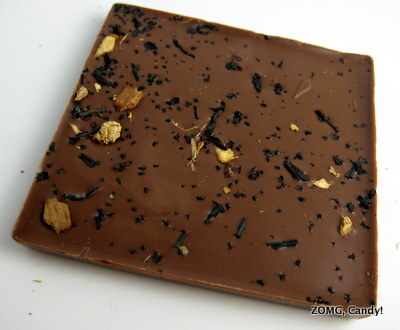 The back of the Earl Grey bar was flecked with black tea leaves. It smelled earthy and woodsy. The milk chocolate broke easily with a soft snap. It melted in my mouth with a velvety, matte texture. The tea leaves had a dry crunch before they, too, melted away. 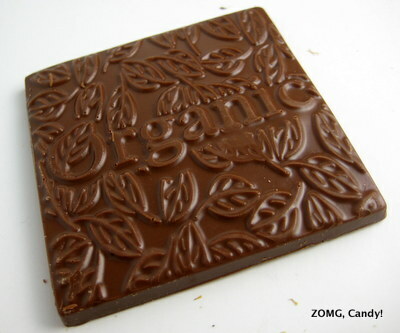 The milk chocolate base had lightly sweet caramel cocoa flavors, while the black tea and bergamot added a subtle woodsiness with a lightly floral finish that paired wonderfully with the chocolate. An OM. The Masala Chai had a warm, spicy scent, thanks to its infusion of cinnamon, ginger, and cardamom in addition to the black tea it contained. Cinnamon came through the strongest and paired well with the chocolate, though it also made it taste sweeter. While I enjoyed the flavors of the Masala Chai, I had some problems with the texture. The black tea crunched and melted away, but there were also tooth-breaking bits of cinnamon bark that I had to spit out. An O because I don’t like having to pick chocolate bar leftovers out of my mouth. More Shangri La reviews to come on Thursday, and something fun for you readers on Friday!